Ashwagandha (Withania somnifera also known as Indian Ginseng) is a powerful herb that has been used for hundreds of years to treat a wide variety of conditions in the traditional form of Indian medicine known as Ayurveda. Ayurveda – literal meaning, the science of life (“Ayur” = life, “veda” = science) – is a highly evolved medical science that was developed in ancient India centuries ago. In Sanskrit ashwagandha means “smell of a horse.” That’s because this herb is said to impart the vigor and strength of a stallion, and has traditionally been prescribed to help people strengthen their immune system after an illness. Although ashwagandha is frequently referred to as “Indian ginseng” because of its restorative properties, traditional Chinese and Korean ginseng and ashwagandha are not related botanically. Ashwagandha extracts have been shown to contain many beneficial compounds, including withanolides, alkaloids, choline, fatty acids, amino acids, and sugars. While its leaves and fruit do contribute to ashwagandha’s health benefits, extracts of its tuberous roots are most commonly used in herbal remedies. As many as 200 studies have been carried out on ashwagandha. Let’s take a closer look at some of the scientific evidence for this superstar medicinal herb. Ashwagandha is primarily acts as an “adaptogen.” Adaptogens are substances that stabilize and balance various physiological processes within the body, especially in response to stress and a changing environment. For example, ashwagandha is known to reduce overall cellular sensitivity to stress. Chronic stress is an ever-present facet of our modern lives and has been linked to a higher risk for a number of illnesses. In a 2016 study, a double-blind, randomized clinical trial was carried out on 52 people who were subjected to chronic stress and who received either 300 milligrams (mg) of ashwagandha or a placebo control twice daily. Treatment with ashwagandha significantly reduced stress levels felt by the study subjects, as assessed by various questionnaires. At the same time, blood cortisol levels (a reliable indicator of stress levels), body weight, and body mass index (BMI) were noticeably better in the ashwagandha treatment group when compared to controls. Similarly, 60 days of treatment with ashwagandha significantly reduced both stress and cortisol levels in 64 subjects in another double-blind, randomized, placebo-controlled clinical trial. These studies and others indicate that ashwagandha can help to effectively and safely managing chronic stress and its consequences. Along with alleviating stress symptoms, it is also known to combat fatigue, infuse energy, and enhance powers of concentration. Overall, ashwagandha confers a sense of rejuvenation and wellbeing. Ashwagandha may be able to benefit people with low thyroid function, since animal studies show that it has a thyroid hormone balancing effect. For instance, when ashwagandha root extract was given daily to adult mice for 20 days, researchers found that their blood levels of both thyroxine and tri-iodothyronine (T3) were increased. Thyroxine is the hormone secreted by the thyroid gland into the blood, from where it travels to organs like the liver and kidneys and gets converted to its active form, tri-iodothyronine or T3. T3 affects almost every physiological process in the body, from growth and development to metabolism, body temperature, and heart rate. Similarly, in a randomized clinical trial, 8 weeks of treatment with ashwagandha was seen to increase levels of thyroxine in patients with bipolar disorder. In other words, ashwagandha appears to help correct hypothyroidism by balancing the level of thyroid hormones. In a 2015 laboratory study, rats given fructose for 8 weeks showed significant increases in their blood sugar and insulin levels, along with higher insulin resistance. However, rats treated with ashwagandha root extract along with fructose did not show these changes. In other words, the onset of diabetes-like symptoms was stopped in its tracks by ashwagandha treatment. Separately, ashwagandha has been shown to raise the levels of the liver enzyme glucose 6-phosphatase, which is known to play a key role in controlling blood sugar levels. In the thyroid study described earlier in which ashwagandha root extract was given daily to adult mice for 20 days, lipid peroxidation in the livers of these mice was found to be reduced as well. Lipid peroxidation is the process by which harmful free radicals steal electrons from lipids that make up protective membranes in our body’s cells, damaging them and the cells they are meant to protect. In other words, treatment with ashwagandha root extract significantly reduced the extent of free radical-induced damage in the liver. At the same time, it also enhanced the activity of other antioxidant enzymes that are found naturally in the liver, including superoxide dismutase (SOD) and catalase, thereby boosting overall antioxidant activity. Similarly, treatment with an extract of ashwagandha was seen to reduce levels of malondialdehyde – an indicator of oxidative stress – while also boosting total antioxidant capacity in mice. Laboratory evidence in mice suggests that ashwagandha can dramatically increase numbers of white blood cells, thereby boosting immune system activity. Indeed, studies have shown that ashwagandha can help prevent the immune system from becoming suppressed during chemotherapy. Normally lower white blood cell counts occurring as a result of chemotherapy places patients at a higher risk of infections, but this risk may be reduced by ashwagandha therapy. A 1991 study published in the Journal of Ethnopharmacology examined the efficacy of a herb-mineral formulation containing ashwagandha root, the stem of another medicinal herb Boswellia serrata (known as Indian frankincense or Shallaki in Sanskrit), rhizomes of Curcuma longa (turmeric) and a zinc complex in a randomized, double-blind, placebo controlled, cross-over study in patients with joint pain. In this study, 42 patients with joint pain were randomly allocated to receive either this formulation or a placebo control for three months. At the end of the study period, researchers reported that “Treatment with the herbomineral formulation produced a significant drop in severity of pain (P less than 0.001) and disability score (P less than 0.05)” with no significant side effects. In conclusion, ashwagandha is a powerful adaptogenic herb whose many researched benefits include increased stamina, relief from the effects of stress, rejuvenation, balanced thyroid hormone levels, lowered blood sugar and insulin, joint pain relief, neutralization of harmful free radicals, and a powerful boost to the immune system. Ashwagandha is an ingredient in the Detoxx 2-part cleanse system from Organixx specifically designed to give you the most powerful yet gentle cleanse experience possible. Changes in thyroid hormone concentrations after administration of ashwagandha root extract to adult male mice. Withania somnifera and Bauhinia purpurea in the regulation of circulating thyroid hormone concentrations in female mice. Subtle changes in thyroid indices during a placebo-controlled study of an extract of Withania somnifera in persons with bipolar disorder. Health benefits of Ashwagandha include its ability to enhance stamina and stress-relieving properties. Extracts of its tuberous roots are most commonly used in herbal remedies. Ashwagandha can help to effectively and safely managing chronic stress. Ashwagandha helps correct hypothyroidism by balancing the level of thyroid hormones. It also helps manage blood sugar, neutralize free radicals, boost the immune system, and relieve joint pain. I just bought a bulk package of organic ashwagandha yesterday because I saw it in the, much appreciated, many readings from you. Can you tell me how to use it for maximum benefit? Is there a formula or recipe? I use this herb occasionally and while I do not know how to use it in the state you have it, “Herb Pharm” is a good company that makes it in herbal drops for around $10 a bottle. I would try a drop and then slowly add more as you feel needed. I use it to calm my adrenals down. I have recently found that I am allergic to nightshades, especially potatoes. I have eliminated all nightshades for now. I have so many of your products and feel I need to stop the ones that have ashwagandha. What are your thoughts on this being a nightshade? Also, if you have problems with recurring intestinal yeast, should you also avoid fermented foods? Would this mean I could not use any of these products? In the first part of this article it states that ashwagandha contains choline. A recent Harvard study linked choline to increased risk of aggressive prostate cancer. I’m concerned about giving the supplements containing ashwagandha to my husband because of the choline. Please share your feelings about this. Thank you. I would also like to know how much ashwagandha is in the turmeric 3D blend. It states that it is an ingredient but does not tell how much is included. If my doctor suggested I supplement with ashwagandha, is the amount in the turmeric 3 D a sufficient dose or should I use an additional ashwagandha supplement? 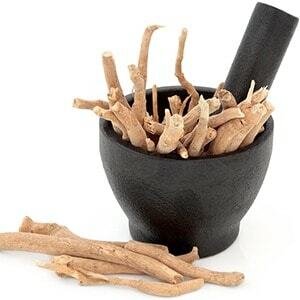 Ashwagandha Extract is effective anti-stress and mode alleviator. Hello, Nice and detailed information about Health Benefits of Ashwagandha . We’re happy you liked this article, Megha! Thank you for the feedback.